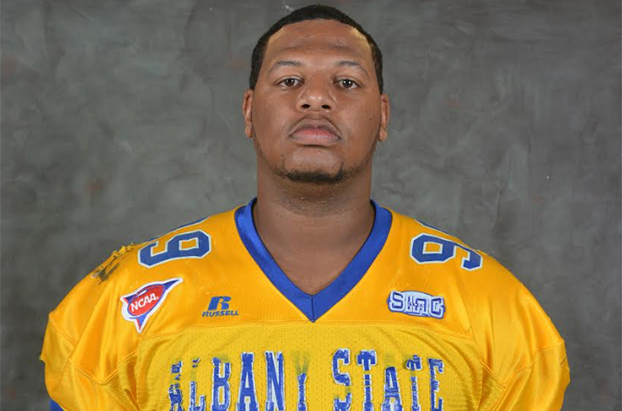 The Indianapolis Colts selected Albany State defensive lineman Grover Stewart with the 144th pick in the fourth round of the NFL Draft. The 6-foot-5, 334-pound lineman was a four-time All-SIAC standout. Stewart recorded 15 tackles for loss and 7.5 sacks as a senior in 2016. Touted as having an “NFL-ready frame,” Stewart has been projected to be a run-stuffing interior lineman who can play nose guard or the three-technique position at the next level. Very active interior defensive lineman, and very productive. Put together a very impressive East West Shrine game against much higher level of competition than he has been used to. Gets in the backfield quickly, but will have a big learning curve. Should be able to be a good rotational player to start his NFL career, and has a high ceiling.